Can you handle the heat? Don't worry this fragrance won't burn your skin like spicy curry can burn your mouth! Our Curry Cologne is a spiced combination of prik kee noo, a fresh and spicy Thai chili, lemongrass, lime, cilantro and galangal, a gingerlike root, but more delicate. 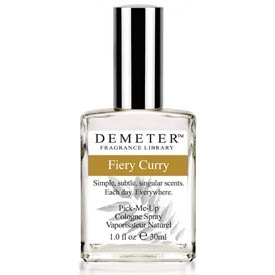 Altogether, Demeter’s Spiced Thai Curry Scent is an invigorating and refreshing experience. On a one to ten spicy scale, I would rate this cologne a seven. What do you think?